This grain-free complete Feringa Adult Chicken and Trout dry cat food is made with love and high quality ingredients to ensure your cat receives balanced, natural nutrition. Your feline friend can enjoy double the pleasure with this dish, as it contains two delicious sources of valuable animal protein. Carefully selected chicken and flavoursome trout combine in a wholesome recipe, completed with pumpkin, cranberries and just a touch of catnip. The premium ingredients are gently prepared by a family-run Austrian busineΒ to preserve natural nutritional value and rich natural flavour. As your cat's digestive system is not designed to cope with large quantities of cereal, this dish is entirely free from grain. Feringa – lovingly prepared, just like home-made! Feringa Adult Chicken and Trout dry cat food at a glance: High meat content: Feringa dry food is made from plenty of digestible poultry meat. Cats are natural carnivores, and Feringa provides a natural, species-appropriate diet. No grain: Feringa contains absolutely no grains, as cats are not able to digest them in large amounts. 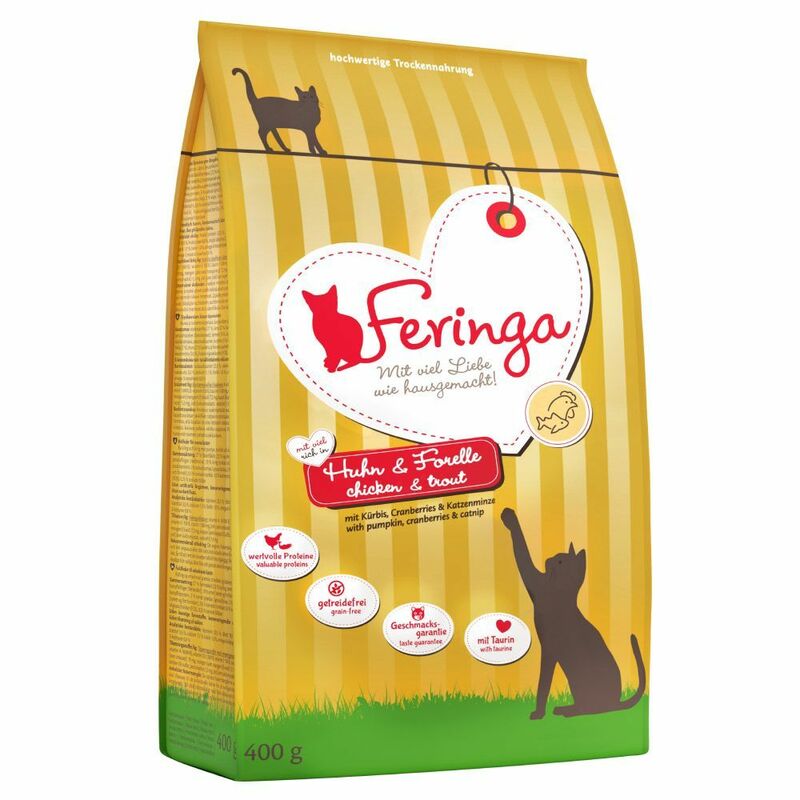 Made by a small family busineΒ: Feringa dry cat food is made with love and care by a small family busineΒ in Austria, where creating natural and species-appropriate nutrition is at the heart of the busineΒ. Feringa – tastes just like home-made!.